The Philadelphia Eagles punched their ticket to the Super Bowl with a 38-7 victory over the Minnesota Vikings at Lincoln Financial Field. The Eagles rallied behind QB Nick Foles and used a punishing defense to take control of the game from almost whistle to whistle. The Eagles did not allow the Vikings to score after their first possession and put up four offensive touchdowns on one of the best defenses in the NFL. Foles was 26-of-33 for 352 yards and three touchdowns on the day. He did not commit a turnover in the game, and neither did any of his teammates. RB Jay Ajayi led the team with 73 rushing yards, but it was RB LeGarrette Blount who punched in their lone rushing touchdown. WR Alshon Jeffery scored two touchdowns through the air but came in second in receiving yards behind TE Zach Ertz, who had 93 yards on eight receptions. QB Case Keenum was 28-of-48 for 271 yards for the game. He threw one touchdown, but he was also intercepted twice and lost a fumble. RB Jerick McKinnon had 40 rushing yards on 10 carries, but the Vikings were forced away from the run game early due to the score, although McKinnon was still a large factor in the passing game. TE Kyle Rudolph caught a 25-yard touchdown pass on the opening drive, but that was his lone catch of the evening. With that, we give you our PFF-exclusive takeaways from the contest for each team. Entering the game, Foles had been fairly underwhelming in his four starts replacing Carson Wentz. However, he looked like a completely different player on Sunday evening, putting together the best game of his career and one of the best performances by any quarterback this season. In his first four games, he completed 2-of-15 passes targeted 20-plus yards downfield for a passer rating of 13.8. In this game, he was an absurd 4-of-6 on deep passes for 172 yards and two touchdowns, culminating in a passer rating of 149.3. Ertz didn’t find the end zone, but he was Foles’ go-to receiver when they needed a first down. He caught all eight targets, four of which came against safety Harrison Smith, who graded out as the best safety this season. Five of Ertz’s receptions picked up first downs, including four that came on third down. The Eagles defensive front dominated throughout the game and the numbers back it up. They were able to generate pressure on nearly half of Keenum’s 50 pass attempts. Long led the way with a pass-rush grade of 89.9, recording seven pressures while also playing a large part in the pick six, as his hit on Keenum affected his arm angle, leading to a poor throw. Cox continued his all-pro season with another outstanding performance, generating six pressures while routinely beating the Vikings interior offensive line. Three Eagles defensive linemen recorded pass-rush grades over 85.0, as Minnesota struggled to match up with their talent up front. Early on, it was clear the Vikings game plan was for Keenum to get the ball out quickly, but as the game progressed the pocket around him collapsed just as quickly. He was under pressure on 24 of his 50 dropbacks and the numbers show he struggled in those circumstances. He was 11-of-22 for 108 yards and he an interception under pressure in this game. It will be an interesting offseason for the Vikings, as they’ll have to decide which quarterbacks to hold onto as Keenum, Sam Bradford, and Teddy Bridgewater are all in the last years of their deals. McKinnon accounted for most of the Vikings offense, accumulating 86 yards in the passing game and rushing for 40 yards. Even though a chunk of his receptions came late in the fourth quarter in garbage time, he still caught 11 of the 12 passes thrown his way. Most of the Vikings’ offensive weapons were neutralized, as Stefon Diggs and Adam Thielen were held to a combined 98 yards on 20 targets. Minnesota had one of the best defenses this year, and while the blame certainly goes all around for their performance in this game, it was an inopportune time for Waynes to have one of his worst outings in coverage this season. He allowed six catches for 105 yards and two touchdowns on the night. 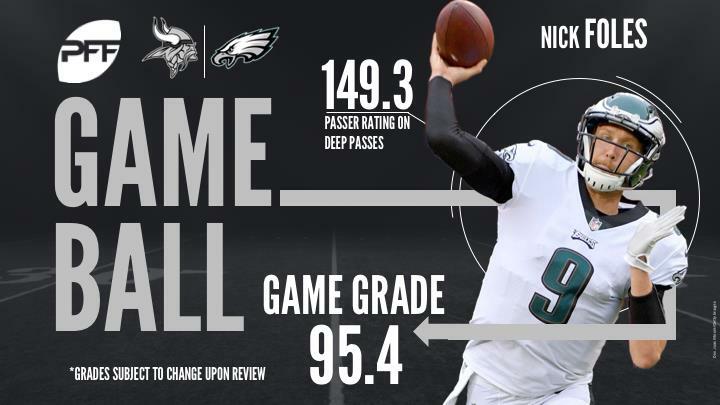 Foles had a perfect 158.3 passer rating when targeting Waynes, a figure that wasn’t helped by Waynes losing track of Torrey Smith on a flea-flicker. Hunter was one of the lone bright spots on the Vikings’ defense. Minnesota didn’t get much pressure on the quarterback, but when they did it was usually Hunter being the one who got there. He accounted for over one-third of the Vikings’ total pressures. He also led the team with five defensive stops, a season-high for Hunter.